Arnica Montana - Leopard's Bane - is a popular and versatile equine anti-inflammatory remedy which can aid the healing of bruises, bruising, soft tissue injuries, wounds, bruised soles, muscular strains and soreness, joint stiffness, lameness pain in the horse. It can also be useful for the treatment of shock and trauma. It has become known as "Homeopathic Bute" - as it is anti-inflammatory. It is also believed to be anti-bacterial. 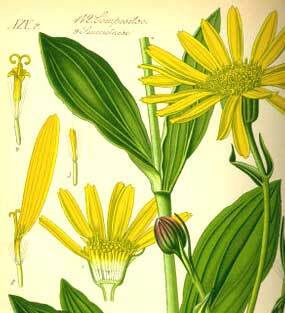 Arnica preparations for horses are to be found in ointment, spray, liquid, liniment, gel, tablet, pillule or pill form. The treatments can be applied externally or taken internally. Arnica should not to be applied to open wounds , and, be careful, not all forms may be given internally to a horse or pony. it is important to check this carefully when you buy Arnica to treat your horse! As well as treating existing problems Arnica can be used as a preventative medicine for your horse. Used prior to a strenuous ride or training session it can help to prevent soreness. If used after exercise it can help to prevent the horse from stiffening or tying up. It can also be used as a liniment during massage. Arnica works on horses by by dispersing trapped fluids from bruised tissue and stimulating the activity of the white blood cells. The active ingredients in Arnica are sesquiterpene lactones. These are known to reduce inflammation and pain. One of these sesquiterpene lactones is Helenalin. It is not fully known how sesquiterpene lactones in Arnica exert their anti-inflammatory effect. Can be used before and after strenuous exercise to help prevent stiffness. Arnica Cream: Apply to bruised areas, but NEVER on open wounds or broken skin. Pills / Pillules / Tablets: After injury, dose as often as every 15 minutes with 5-10 small pills, either directly into horse's mouth or dissolved in water until a positive response is seen. Continue dosing twice daily for up to 7 days, or until bruising or lameness subsides. ALWAYS check the manufacturer's instructions. NOT to be used on open wounds or broken skin!! Arnica does not replace any veterinary treatment. Internal use can cause a toxic action upon the heart and may cause large increases in blood pressure. Arnica is a herbaceous perennial plant with orange-yellow daisy like flowers. It is mainly the dried flower heads that are processed to provide homeopathic remedies. It is common in many parts of Europe, Canada and North America and Russia. Arnica grows on alpine meadows, pastures and light forests up to the alpine level. A North American tribe, The Cataulsa, made a tea from arnica roots to treat back pains. Johann Wolfgang von Goethe, The German poet and philosopher , used arnica to treat his angina. He claimed it saved his life.